Environmental Advantages – Inland Rivers, Ports & Terminals, INC.
Inland barges carry approximately 15 percent of the nation’s freight at the lowest unit cost while offering an environmentally-sound alternative to truck and rail transportation. The measure of energy efficiency in transportation is the amount of energy used for the service provided, and can be expressed as the number of BTUs required to move one ton of cargo one mile (a ton-mile). In studies comparing rail, truck, and water, shallow-draft water transportation has been proven to be the most energy efficient method of freight transportation for moving bulk raw materials. An analysis of rail and waterway fuel efficiency shows the average BTUs expended per ton-mile totals 433 for water transport, and 696 for rail transport. It is much more efficient to move cargo through water than over land. Size is the key to water transport’s efficiency. The capacity (1,500 tons) of an inland barge, which can carry five times its own weight, is impressive, and the industry as a whole has enormous capacity. The cargo capacity of a barge is 15 times greater than one rail car and 60 times greater than one semi trailer. 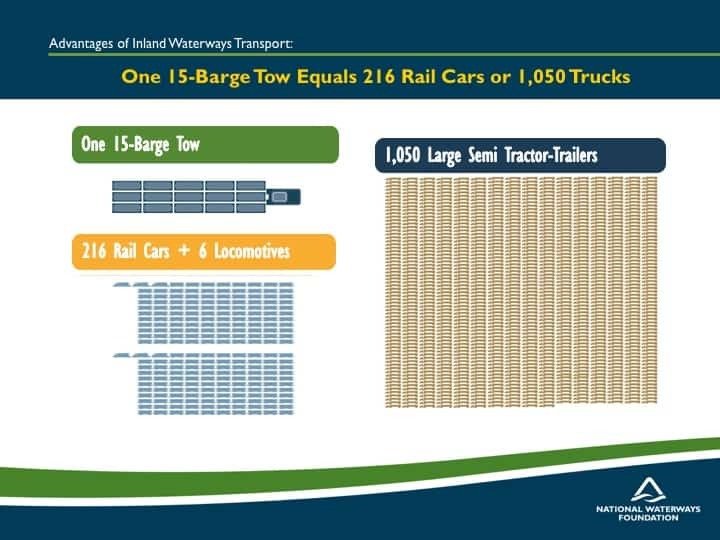 To move the same amount of cargo transported by a standard tow (15 barges) would require a freight train 2 3/4 miles long or a line of trucks stretching more than 35 miles. On the lower Mississippi, one 10,000 horsepower towboat can push 40 barges that have the carrying capacity of 600 railcars or more than 2,200 trucks. Transporting cargo safely is an important measure of environmental responsibility, and water transport has the fewest number of accidents, fatalities, and injuries as compared to truck or rail. Truck and rail tank car spills occur more often than barge spills. Barges, because of their much larger capacity, require far fewer units than either rail or truck to move an equivalent amount of cargo, and so the chance of a spill is less likely. Also, design features of barges such as double- hulls and navigational aids help reduce accident frequency. Recent legislation requires all new inland tank barges carrying liquid cargoes to be built with both an inner and outer hull. However, for some time water transport operators have realized the need to protect the environment, and about two thirds of the inland tank barges that have been constructed in the last ten years have either a complete double hull, double sides, or a double bottom. For any hazardous liquid material shipped by water, the United States Coast Guard maintains a comprehensive list of safeguards and controls that govern the design and construction of vessels and equipment, and personnel manning qualifications. Construction of tank barges must be approved by the Coast Guard, and once in service, they are inspected annually. Coast Guard statistics show that water transportation is better inspected and regulated from a safety point of view than either of its competing forms of transportation. Other impacts of traffic congestion are: accidents, increased energy consumption, environmental damage, increased commuting times, and greater social tension. Water transport, in contrast, does not have congestion problems, and seldom causes them for others. The fact is, that far from being congested, the country’s water transport system is under utilized. Some of the most pervasive and intrusive sources of noise and air pollution are transportation systems. Noise levels, with road traffic the chief offender, have been rising. Air pollution comes from a wide variety of man-made and natural sources, with fossil fuel combustion the largest contributor. Air pollution caused by transportation includes pollutants directly emitted by engines as well as secondary pollutants formed by chemical reactions. Road traffic is, by far, the greatest source of air emissions. Water transport, conversely, causes far less air pollution than trucking, and less or comparable amounts, than rail. Cumulatively, it has a relatively minor effect on air quality, consumes much less energy (and as a result, produces less air pollution) per ton-mile of freight carried than either rail or truck. For the most part, waterway operations are conducted away from population centers, which reduce the impact of its exhaust emissions. Little data exists on noise levels of barge operations, mainly because they are not considered a problem. Towboats operate well away from shore, with the sound of their engines muffled below the water line, and any noise levels are hardly audible beyond the immediate area of the tow. Trains rumble through cities and trucks travel streets and highways. Barges, on the other hand, quietly make their way along isolated waterways. Reduced social interaction, reduced access to other neighborhoods, and increased traffic congestion and/or unwelcome traffic patterns are -often a result of increased surface traffic. The impact of rail lines passing through urban areas, and trucking operations occurring in close proximity to high-density population areas, can become a disturbing element to an otherwise reasonably calm environment in settled areas. By contrast, water transport has little impact on densely populated areas: shallow-draft vessels operate in mid-river, well away from shore, and because of the large tonnage moved at one time, tow passages are infrequent. Since most of the right-of-way for water transport is provided by nature, navigation is less likely than other transport forms to compete with non-transportation uses for land area, an important consideration in urban locations. Extensive land area can be taken up by new highways and railroad corridors, but apart from a few connections and waterside terminals, waterways preempt very little land. Transporting bulk commodities by water has many other positive benefits and many beneficiaries. When a new navigation project is completed, more than water transportation benefits. The other major beneficiaries of developed waterway systems include recreation, flood control, public water supply, irrigation, and industrial use, all uses that can be as important as the navigation project itself. Navigation not only creates opportunities for new industries, but may also change trade patterns that can have a major economic impact on local and regional development. There is a growing national commitment to restoring and preserving our environment, and this goal has become a priority in business planning.